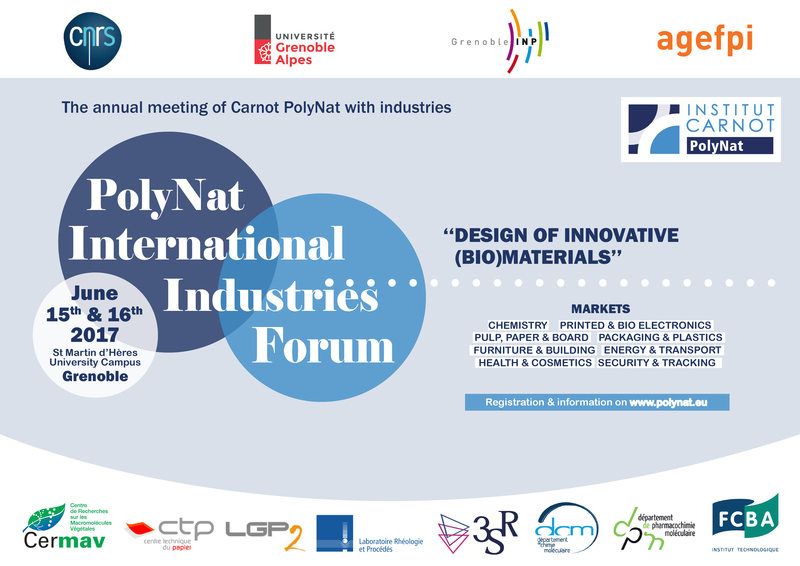 For the 3rd time, PolyNat is organising its International Industries Forum which will bring together PolyNat researchers and industry representatives around new R&D challenges on biomaterials. For two days, industry representatives will present their R&D projects and and give their outlook on future challenges regarding biosourced materials. A great opportunity to understand the future R&D challenges and industrial needs and strenghen ties between the research and the industrial world on this topic. Hitachi (Japan), Itri (Taïwan), CSEM (Switzerland), HGST (USA), Booregard (Norway), Schneider Electric, CGL Pack, Munskjo, Owens Corning… have already confirm their participation. You are a PolyNat researcher or a compagny working with us ? > Come and suscribe ! This entry was posted in News on 11 May 2017 by Karen Peruchon.